SnapStay Insulators put their product on show this year at the Rockhampton Beef Festival and the Toowoomba Farm Festival and had fantastic success. Over eight days of exhibitions, only positive feedback was received and sales were tremendous. Visitors to the showcase kept finding other uses for the insulators, such as supporting tomato bushes, because the product can be easily moved anywhere up the post as the bushes grow. Supporting chicken wire is another use for SnapStay Insulators. SnapStay Insulators are a new product that greatly improve productivity when erecting fences using steel posts. The product is flexible and strong, simple to use, and fast and efficient. SnapStay Insulators fit on both sides of steel pickets, old or new. This is a great help if posts are hammered in the wrong way round or for just placing the electric wire or tape on the opposite side of the barbed wire. It was also recently discovered they can fit round fibre glass poles for temporary fencing. The multipurpose head on SnapStay Insulators takes wire, cord or tape up to 40mm wide. SnapStay Insulators are built to last. The strength is in the legs and not the pin, the pin only being used for vertical positioning when under tension. 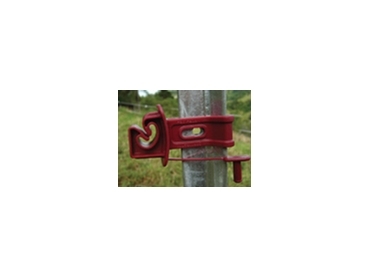 SnapStay Insulators would also be ideal for smaller farmers wanting to build lower cost fencing. The SnapStay insulators stand out from the fence more than traditional insulators and may reduce the need for outriggers.